You might be looking to buy a beautiful piece of diamond jewelry as a gift, a token of love, or even an engagement ring. No matter what you are wanting, it is the diamonds that really make the piece. Choosing the diamonds can have a huge impact on the beauty, value and style of the piece. But when it comes to finding the jewelry you want, be it a ring, earrings, broach or necklace, the diamond setting styles are what makes the difference. When you give a piece of diamond jewelry people don’t notice a minor difference in clarity. People notice the ‘look’ of the jewelry, and it’s the setting of the stones in the ring that creates that look. There are dozens of popular diamond setting styles out there, most of them are beautiful, and a choice often comes down to personal preference. The setting styles of diamonds often focuses on the ‘main’ stone (or stones) of the piece. In many cases though, the real style of the jewelry is brought out by smaller diamonds which highlight the center stone. The Bezel setting is one of the first techniques used to attach gemstones to jewelry. 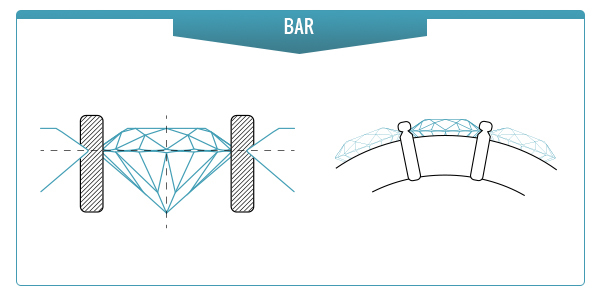 The most common bezel technique is to shape a piece of metal to match the gem stone. It is then attached through solder and by crimping the metal around the girdle of the diamond. 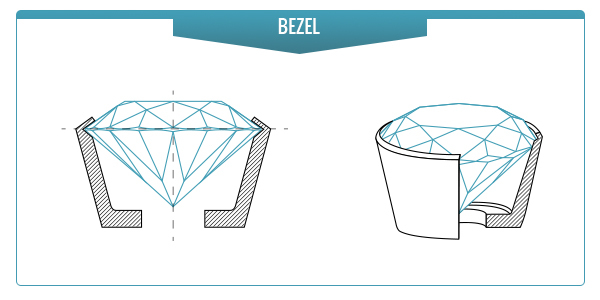 A bezel setting is one of the most secure ways to set a diamond, keeping it safely in place, and guarding it against sharp knocks that could cause small chips in a diamonds exterior. Many people compromise by choosing a ‘partial bezel’ where the diamond’s girdle protrudes above the setting. 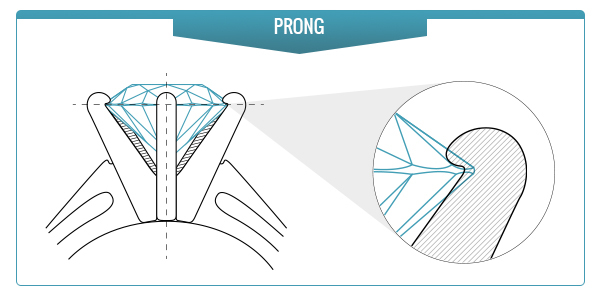 The diamond is held in place by a solder, and sometimes by prongs as well. One of the most popular setting styles for diamonds, the Prong setting holds a diamond in place with (usually) six prongs. A prong setting shows off the entire diamond, and allows a large amount of light to enter the stone for a dazzling effect. The downside is that you do need to inspect the prongs regularly to ensure they are not damaged, and your stone is more exposed to knocks that could damage it. Because of this a prong setting is not always suited to someone who works with their hands a lot, in these cases a bezel setting may be preferable. The prong setting is used predominantly in engagement rings, but many other pieces that showcase gorgeous diamonds also incorporate it. The flush setting is similar to a bezel diamond setting, however the top (table) of the stone is the only part exposed. Many jewelers set smaller diamonds flush in the band of a ring, creating patterns and highlights to the band, as well as the main stones. 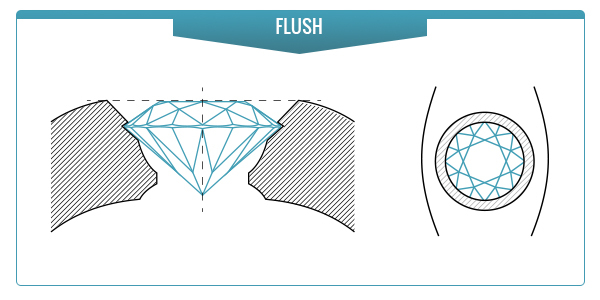 The flush diamond setting is not often used for the main stones of a ring, since it makes the diamond ‘less prominent’. A modern setting style, often used in decorative rings, the tension setting gives a diamond a ‘free’ appearance. 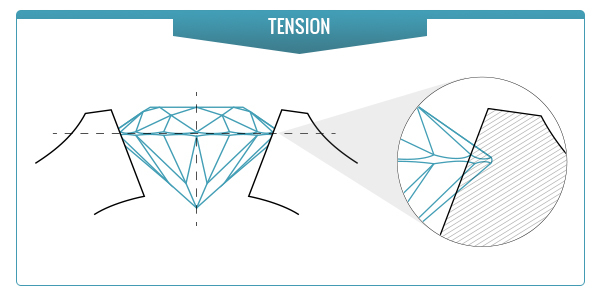 A tension setting ring will often have a band of metal that is separated and overlapping, the natural ‘spring’ in the metal will then hold the diamond in place when placed between this metal overlap. While the tension setting looks amazing, it can be easily damaged by sharp knocks, and the ring cannot be resized. One of the most popular diamond settings is a solitaire. As the name suggests, a solitaire is a piece of jewelry that has only one diamond. These settings are usually used to showcase a high quality, larger stone held in place with a prong setting to show off its complete brilliance. Solitaires are a popular choice for engagement rings, where the stand alone beauty is strikingly noticeable. The three stone diamond is often given as an anniversary ring, and an engagement ring. With a center diamond, and two smaller diamonds, the three stone style represents the past present, and future. The three stone diamond setting is very effective at drawing attention to the center stone. A Halo diamond setting is often used for a decorative gift. It has a centerpiece diamond, surrounded by a ring of smaller diamonds which help draw attention to the center stone. A Masterpiece diamond is the ultimate in a luxury gift. The center diamond has to be at least 2 carats, and have an ornate setting comprised of smaller diamonds. Masterpiece diamonds settings are generally the most expensive available, and comprise of ornate intricate metalwork and diamond settings. Unlike many diamond pieces, ornate settings are generally created as a whole ‘piece’ rather than a way to simply highlight a center stone. Channel settings are commonly used in both the band of a ring, and in earrings. Set between two strips of metal, channel diamonds are flush with the metal, which keeps them comfortable to wear, and safe from damage. The channel setting is very popular in wedding rings, where it highlights the center stone. The bar setting is also common in both rings and earrings. 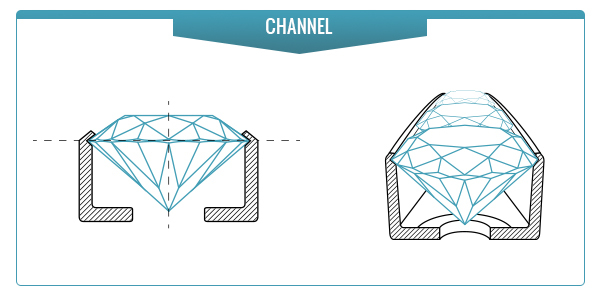 Whilst it is similar to the channel setting in use, it looks very different, as the sides of the diamonds lay exposed, and the stones are held in place instead by metal bars between the stones. Many people love this look as the metal contrasts and separates each diamond. The pave setting is most often used in ring bands, but can also be found on earrings and pendants. 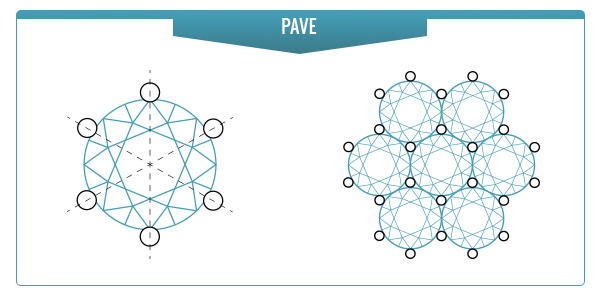 The Pave setting will generally incorporate a large number of small diamonds laid flush with the metal band, very close together but not touching. This creates a solid layer of sparkle, which can make a whole ring sparkle!